Fantastic sprawling ranch situated on a unique cul-de-sac location in the highly sought after Marlwood Estates with gorgeous views of water & distant golf from a deep back yard with SE exposure! Home has total of 5 bedrooms & 4 bathrooms W/ great room floor plan opening to a Fantom Screened loggia with Pecky Cypress ceiling. 26X16 Guest House/Bath W/ private loggia access plus private patio & breathtaking views of water/golf. Office & private bathroom access Loggia as well. 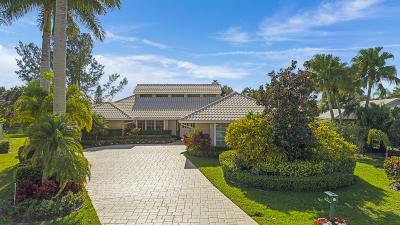 The spacious pool/patio is totally private W/ Lush landscaping & has enclosed new outside shower. Home features newer Plantation Shutters, tankless gas hot water heater, gas fireplace, gas pool heater & summer kitchen, 2 A/C systems, hurricane skylights, Impact glass on all sliders & remodeled bathrooms & SS appliances!